On September 24, the Michigan Department of Natural Resources (DNR) announced that it would reduce Chinook salmon stocking in Lake Michigan beginning in 2013. They plan to decrease the lake’s Chinook salmon population from 3.3. million to 1.7 million, because the salmon’s reproductive success threatens to upset the balance of the lake’s delicate ecosystem. This decision highlights a developing debate about how environmental policy should approach non-native species, while also suggesting a novel way to think about the issue. The debate presently hinges on whether the law should take into account the potential benefits of non-native species. Most existing policies aim to prevent the introduction of non-native species and contain their influence. Schlaepfer et al. argue that government policy should consider the fact that many non-native species contribute to achieving conservation goals. For instance, these species can become food sources for native species, provide shelter for native species, or serve other desirable ecosystem functions. On the other hand, Vitule et al. contend that policy should not change to reflect the potential benefits of non-native species because any potential benefits are too tenuous to be relied upon and are, at any rate, outnumbered by negative effects. The DNR’s recent decision to cut salmon stocking reflects the fact that Chinook salmon negatively impact the local ecosystem in a number of ways, necessitating constant management of their population. Chinook salmon rely on alewives (a type of herring) for their diet. This creates an incentive to keep the alewife population in the lake stable, despite alewives’ negative impact on local species. Alewives, which are also non-native to the Great Lakes, have decimated native lake trout populations, partly because they eat baby lake trout. Adult lake trout can eat alewives, but alewife tissues contain a chemical which creates a vitamin deficiency in lake trout eggs and larvae, causing them to die. Though Chinook salmon have displaced lake trout as the top of the food chain, lake trout are better for the lake ecosystem. Because they do not rely on one food source, lake trout would create a more stable ecosystem, which would not require continuous restocking. Despite Chinook salmon’s negative impact on the lake ecosystem, Michigan spends about $8 million each year to stock them in the lake. Yet the state’s Natural Resources and Environmental Protection Act (NREPA) prevents the introduction and spread of “aquatic invasive species.” This apparent contradiction is resolved by NREPA’s definition of an “aquatic invasive species” as a nonnative species whose introduction causes “economic or environmental harm.” While Chinook salmon arguably pose a threat to the local environment, they have quite a different impact on the local economy. By attracting recreational fishermen, salmon contribute between $1.5 billion to $4 billion to Michigan each year. Michigan’s policy toward Chinook salmon incorporates more elements of the approach advocated by Schlaepfer et al. than by Vitule et al., insofar as it recognizes the potential positive benefits of non-native species. However, by recognizing non-native species’ economic benefits to humans, independent of their environmental effects, Michigan’s policy also contains a nuance that both sides fail to explore. Schlaepfer et al. briefly mention that economic benefits can derive from non-native species, but they observe that a dearth of quantitative evidence exists in this area. As a case study, Michigan’s Chinook policy provides valuable quantitative data that may help drive future discussion about alternative policies toward non-native species. Martin A. Schlaepfer et al., The Potential Conservation Value of Non-Native Species, 25 Conservation Biology 428 (2011). Jean Ricardo Simoes Vitule et al., Revisiting the Potential Conservation Value of Non-Native Species, 26 Conservation Biology 1153 (2012). 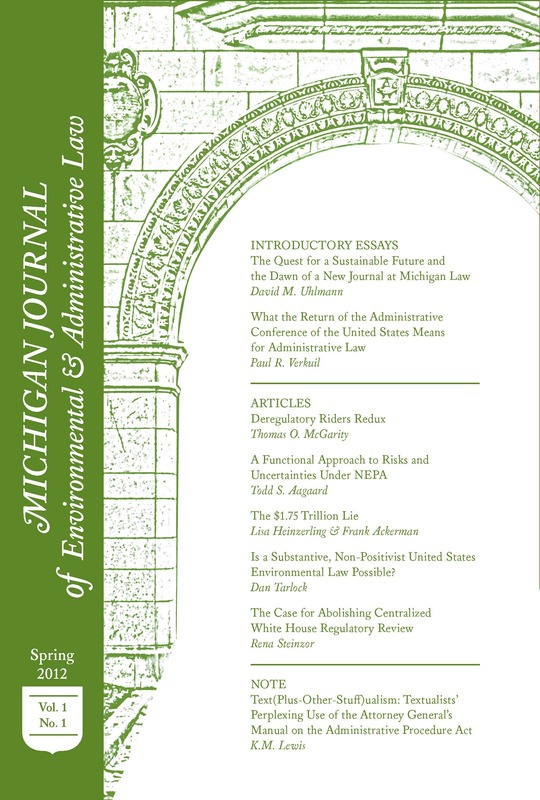 Natural Resources and Environmental Protection Act, Mich. Comp. Law. Ann. § 324.41401 (2011). Prev The Commodity Futures Trading Commission just can’t catch a break. Next Stream Buffers to Protect Endangered Salmon: Where does the EPA stand?